THINK BEFORE YOU CLICK BEWARE OF EMAIL SCAMS! 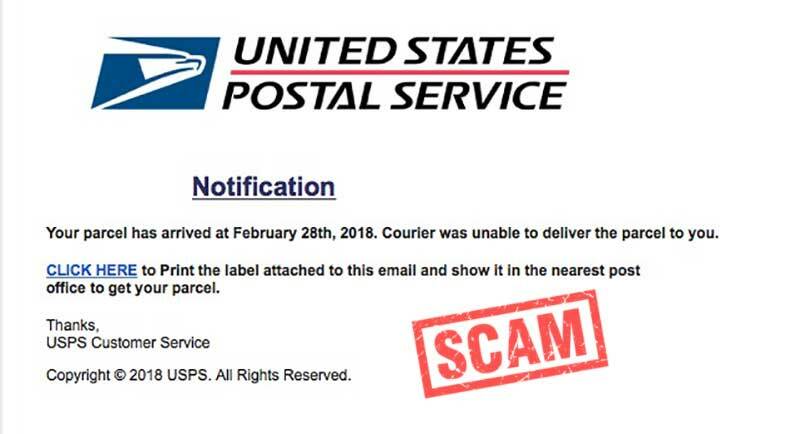 ​USPS officials says beware of an email scam affecting many postal customers. USPS customers have been receiving emails notifying them that the U.S. Postal Service attempted to deliver a package to their residence but was unable to do so. The e-mail will typically instruct its recipient to click on a link to print a delivery label, which they can take to their local post office to pick up the undelivered package. Upon clicking on the link the recipient’s computer will get a malicious virus which can log keystrokes and obtain things such as personal identifier information and account information. According to officials, the USPS does not notify customers that they have a package in this manner. 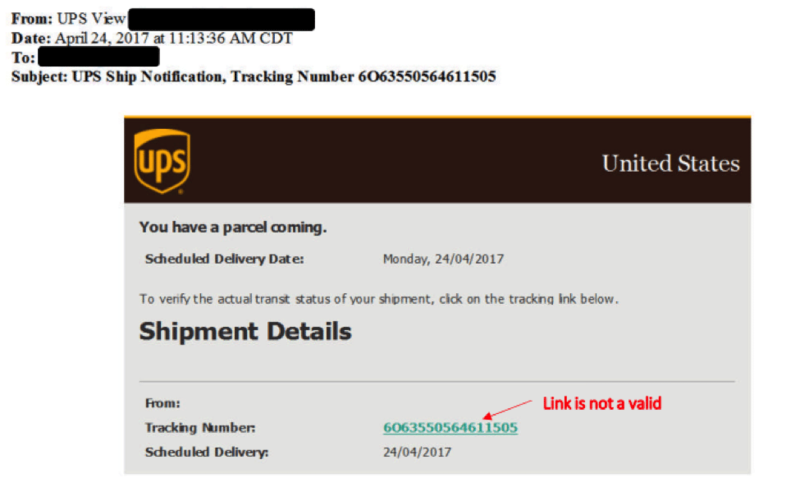 These scammers create these emails to look legitimate like they truly were sent to you from USPS, UPS & FedEx by using these company's logo's in the email message. These scams can take many forms. 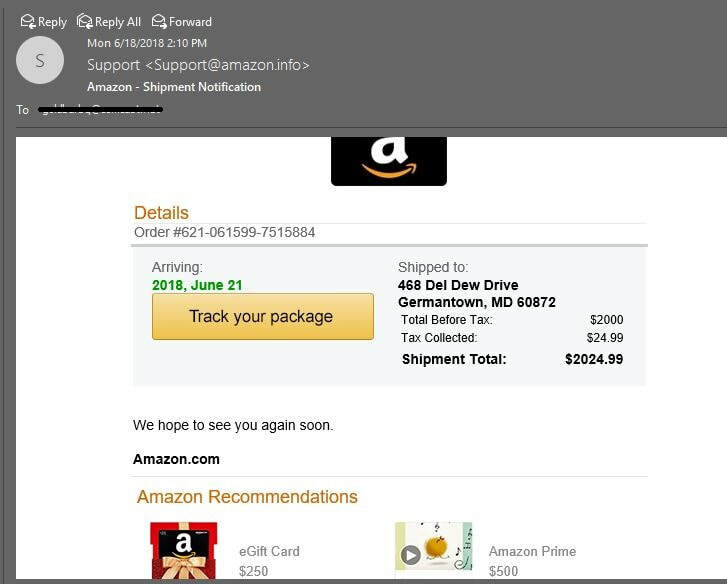 Some people are getting email notices that tell them that a package has or may have been stolen. And to click on the link to help find it. Always use caution when receiving an email asking you to open any link. Speaking of scams here is one that is showing up in email inboxes. It claims a $2,000.00 gift certificate is coming your way, just click in the link to track it. 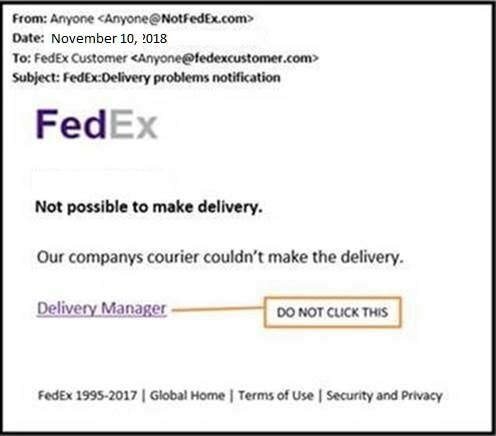 DO NOT CLICK ON ANY LINK in this email. It is not from Amazon. Clicking on any link in this email will infect your computer with viruses and ransomware. Viruses I can clean up for you. Ransomware I can not clean up, and it will end up costing you a lot of money to get your files back from these scammers (if you get them back at all). Delete this email immediately. All of these programs I have personally and many of my customers have used. None of them have any unwanted, damaging, viruses or spyware no ads and no tracking software come along with there downloads. And yes these programs are free however it never hurts if you keep and use them to make a small donation to the developers. You can always find a donation button on their websites. The VLC media player is a free and open-source, portable and cross-platform media player and streaming media server developed by the Video LAN project. VLC plays most multimedia files as well as DVDs, Audio CDs, VCDs, and various streaming protocols. VLC is a much better media player than anything Microsoft has released. VLC will play about any audio and video format you may come across. When an audio or video will not play in Microsoft Media Player or MS Grove Player or anything else VLC will open and play it. One of the main things I like about VLC other than free is I can easily convert Mac / Apple Auto Files ( MPEG-4 & AAC) to MP3 file format that I am capable of playing on my PC without having to install or use iTunes. VLC is so much more than just an Audio / Video player. LibreOffice Looks a lot like and works like Microsoft Office Suite. If you have any familiarity with MS Office, you will have no problem with LibreOffice. LibreOffice includes several applications that make a very powerful office suite. It has word processing (MS Word), spreadsheets (MS Excel), presentations (PowerPoint), Draw & databases (Access). If you need to share a file from LibreOffice with someone that has MS Office. MS Office will open and edit LibreOffice files with no problem. And LibreOffice will also open and edit any MS Office files. One thing OpenOffice does not have that MS Office Suite has is an Email client. That brings me to my next outstanding FREE software. eM Client is a Windows-based e-mail client for sending and receiving e-mails, managing calendars, contacts, and tasks. eM Client is free and user-friendly. You can use it with any of your email addresses. Like Comcast, Gmail, Yahoo, AOL or your own domain. With eM Client’s free version you can only have two email addresses, and it is for personal use only. For $50.00 you can purchase eM client Pro and will be able to use an unlimited number of email addresses along with business use. eM Client does offer a 30-day hassle free trial of there pro addition.